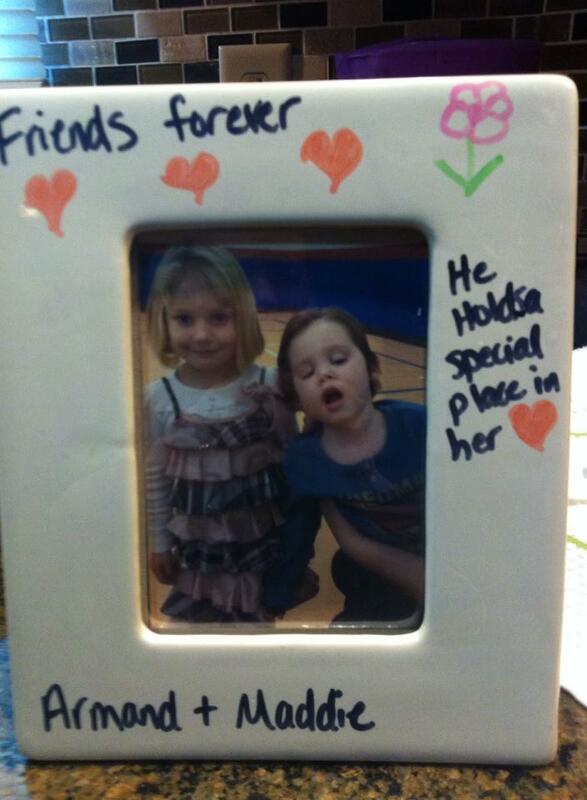 Today we held a small party for a boy, Dylan, and Armand’s best friend at school, Maddie. We wanted to show thanks and recognition to these two kids who have been a friend to Armand despite his condition. Local News Channel 7 was there, and showed it on the 6 o’clock news. Two years ago, Dylan found out about Armand and his disease, and asked his family not to get him birthday presents, but to make a donation to Armand instead. This winter, he posted a picture to his instagram account (dyl_insani), and made a donation for every “Like” he got on a picture of Armand, asking for people to “plz help my friend”. Dylan is 11 years old. Maddie is in Armand’s class at school this year, and has taken a shine to the wee man. She’s made him pictures, she interacts with him (even though Armand can’t talk back), got him a blanket and Spiderman doll for Christmas, and decorated some frames to hold pictures of Armand. We also wanted to recognize Armand’s cousin Gavin, who lives in Michigan. Gavin ran in a 5K to raise money, netting over $150 for Armand. I know I talk a lot about our friends and family and strangers who have helped us (myself and Lindy), but we also need to recognize kids who think about others and donate their time, money, and friendship to a little boy who can’t give much back at the moment.